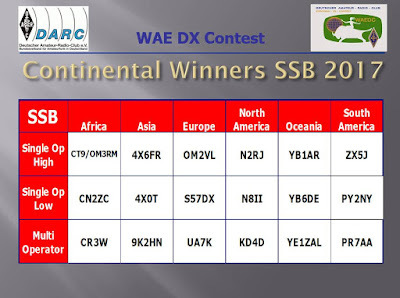 WAE DX contest SSB, N2RJ North America winner! A word about band conditions - I actually prefer worse conditions as it allows me to concentrate on one or two bands rather than having to make decisions about the higher bands. It also reduces the temptation to chase after multipliers on higher bands rather than focusing on rate. No more. I am focusing strongly on running with mult chasing on the 2nd radio almost exclusively. My strategy is changing, and it seems to be working. Special thanks to Keith, KJ8DO for loaning me his Alpha 91B amp. 160 meters and 9 band DXCC!!! I finally got my DXCC on 160 meters. The last entity to confirm was ZA1WW in Albania. Thankfully it was via LoTW so there was no need for a trip to the card checker. How hard was it? Not as hard as you think, but no cakewalk either. The key to 160m operating is listening. "If you can't hear 'em you can't work 'em" is especially true on this band. For this reason I have done extensive research on receiving antennas, noise floor and operating techniques to maximize SNR. I fought many pileups, including some rare (on topband, anyway) entities in far off places like Cote d'Ivoire, and Annobon Island. 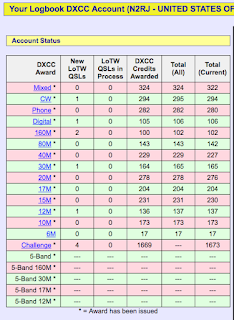 Anyway, I enjoy this for now and bask in the glory of 9 band DXCC!! As I sit here I am working FT8 on 160 meters. It's a great mode to kill time and get some DX, states or new friends in the log. But this mode is not without controversy. Let's explore some of the controversies and see what can, and should be done. Or not. LED lamp QRM - solved! Last week I became really scared because I turned on 40 meters and there was AC buzz all over. I have a relatively quiet noise floor which is advantageous for contesting and DXing, and my fear was that my neighbors had bought some cheap device with a switching power supply that would spew noise all over the HF bands. Or was it the new fridge we bought? Or was it something else? Thankfully cooler heads prevailed and I went about finding the noise source methodically. Watch how I got it done! Troubleshooting The very first thing I did was to get a shortwave radio and verify that the noise was there. Indeed, a portable shortwave radio confirmed that it was there. Actiually, I used my Kenwood TH-D74A in general coverage shortwave mode. It works well for this purpose. The next step was to shut off the main breaker in the house. We did that, and the noise was gone. This alone was a huge sigh of relief! The noise was inside this house, and this means I had full control over it, at least.